In the world of sports and sports marketing there are seats and then there are SEATS. 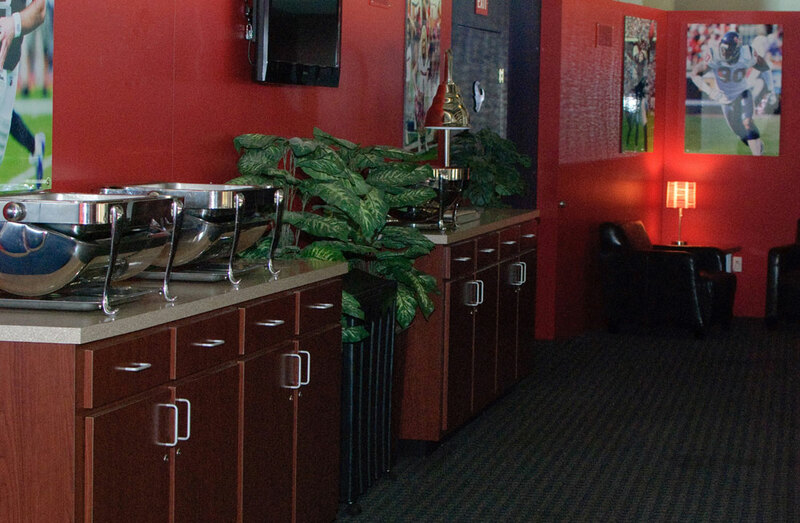 Better known as premium seating or luxury suites where you can sit back and enjoy the excitement of the game — in the comfort and pleasure of a private space where the seats are softer, the menu is catered and that much more delicious and your game day experience is all the more spectacular. Typically associated with larger corporations with big business development budgets to match, these luxury suites create the ideal environment for building relationships, on a whole new level. But what if you're a successful small- to mid-sized company? Sure you can buy a block of great seats to share with your most important clients and prospects but there's not much conversation to be had over the din and roar of the crowd. What if you want more? 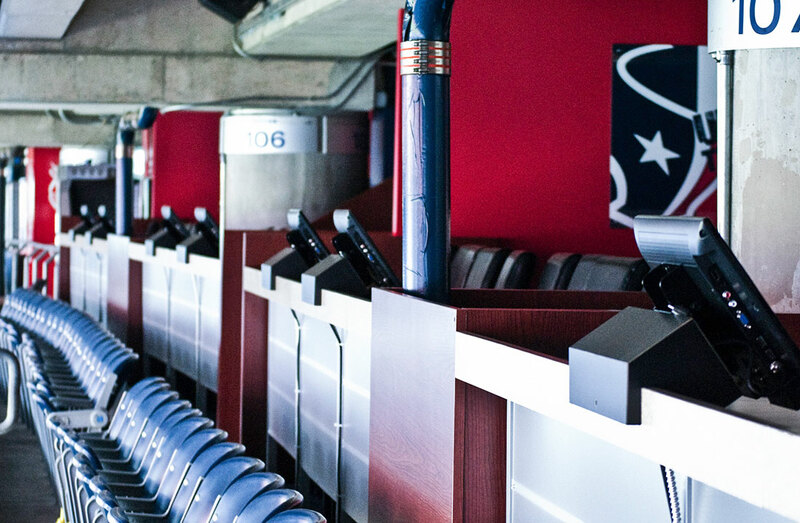 Enter the Houston Texans, who challenged 2020 Exhibits to help them create an entirely new premium seating option for those Texans Fans who want to entertain prospects and clients, while sharing a personalized game day experience in the luxury and comfort of a private, exclusive environment. 2020 Exhibits intercepted the idea and ran with it, setting the stage for an upscale, crowd pleasing and distinctly Texans branded environment. 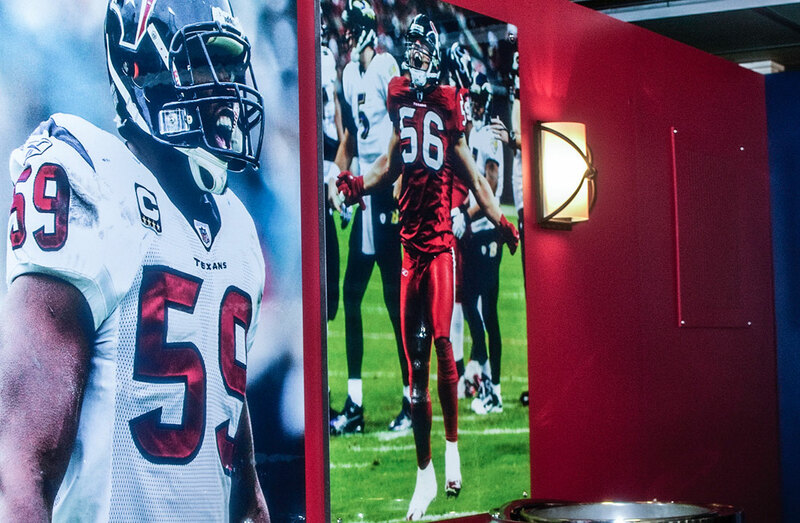 Aptly named the Field Box Suites, the overall feeling is warm and inviting, offering a private, comfortable oasis for business owner fans who want to reward their customers, entertain their clients, colleagues and friends by joining them for a luxury game day experience. 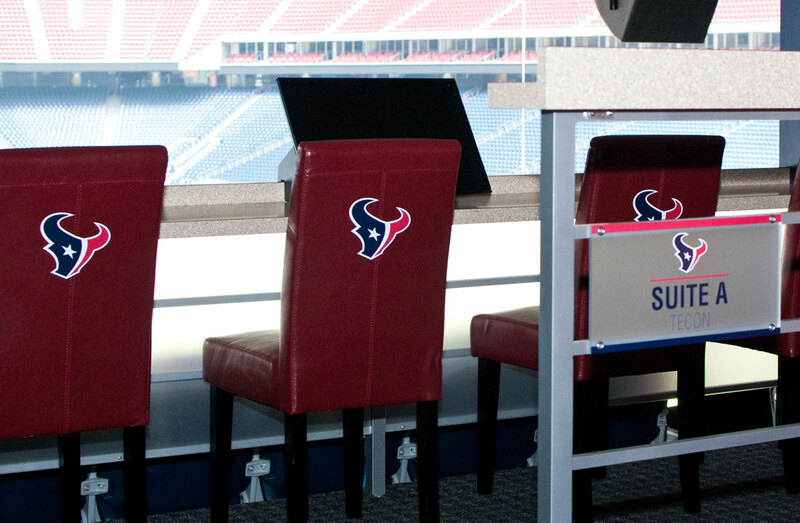 Suite holders and their guests get the best of all worlds within the privacy of their very own Texans- branded space. 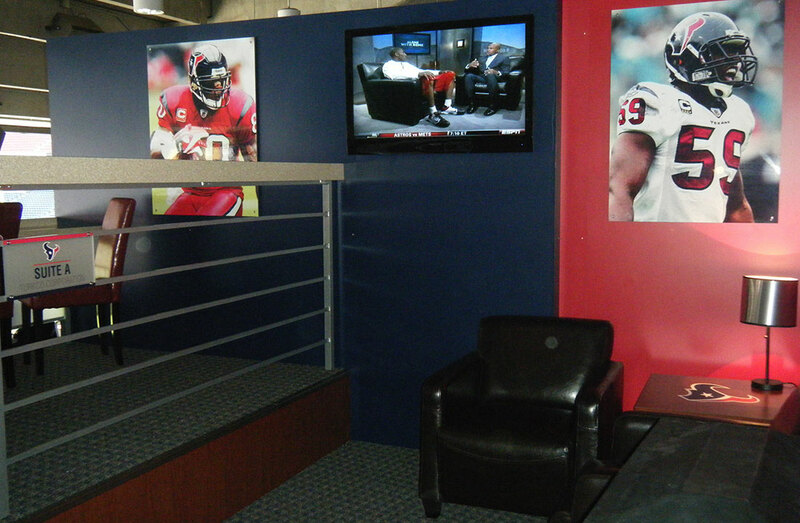 The Field Box Suite design is clean and modern, with a true Texans look and feel. 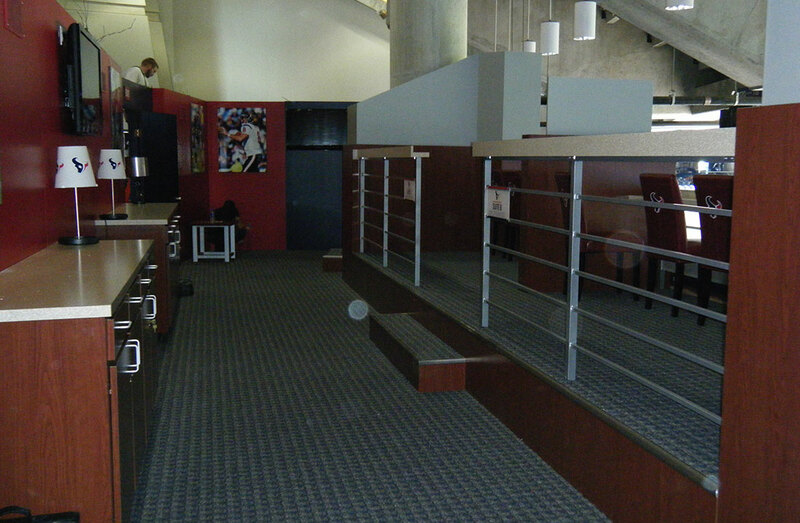 Integrating lights, flooring, media technology and furnishings, this innovative 16'x70' space includes distinct seating areas with a semi-private lounge anchoring each corner. 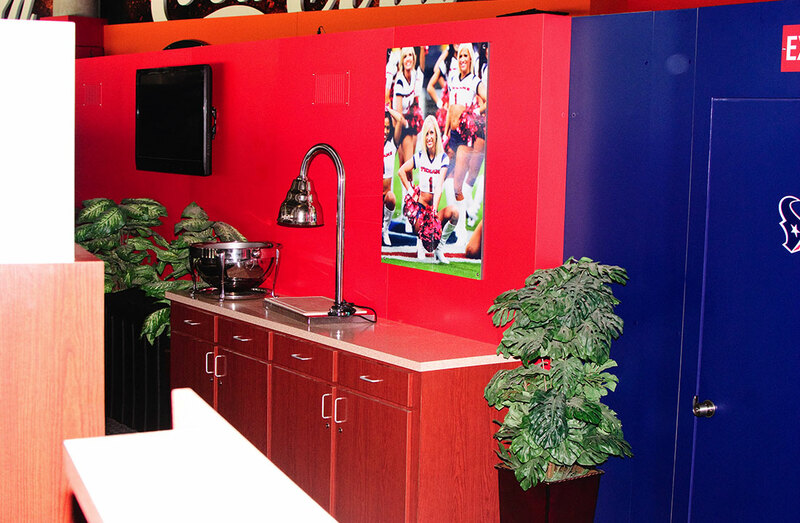 Each suite holder can personalize their game day viewing experience, with in-suite televisions for replays or other NFL action. 52" plasmas are strategically placed throughout, showcasing NFL sports action with large scale action shots of Texan players nearby. 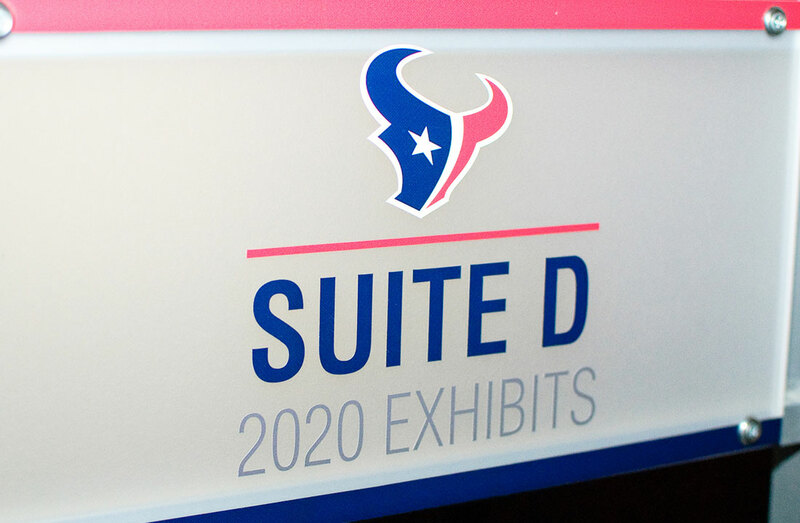 Engaging all the senses, in extraordinary comfort and luxury , the Houston Texans' Field Box Suites + 2020 Exhibits = touchdown!